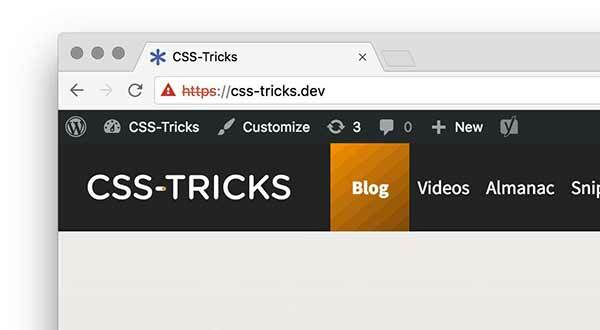 I run most of my production sites with forced SSL, including CSS-Tricks. But locally, I've avoided getting SSL working properly. I've always avoided it, perhaps because it's not immediately obvious how to do it. It's also not that big of a deal since it's just local traffic. But hey, might as well make local work as close to production is possible eh? I've had situations come up where it was actually quite important and affected development. Like a native PHP function that worked differently on HTTPS than HTTP. More commonly, I was working on HTTP locally and an asset was loaded over HTTPS and thus failed (needed manual approval of the insecure certificate). I don't know why the entries are in "error red". It just started doing that, even though things seemingly work fine. Squint. 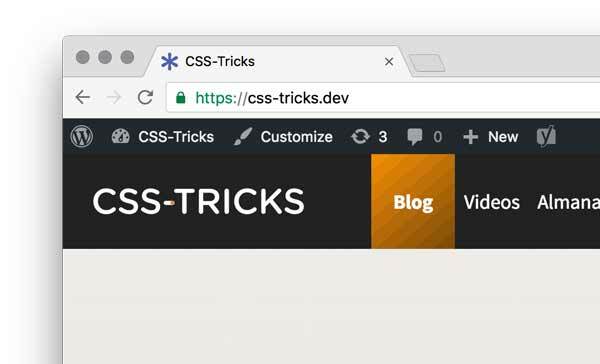 Note there are two entries here for my domain `css-tricks.dev`. That's because one is SSL and one is not. That's how you have to do it in MAMP if you want to serve content on that domain through both HTTP and HTTPS. The trick to trusting that local certificate happens at the system level through the program Keychain Access. 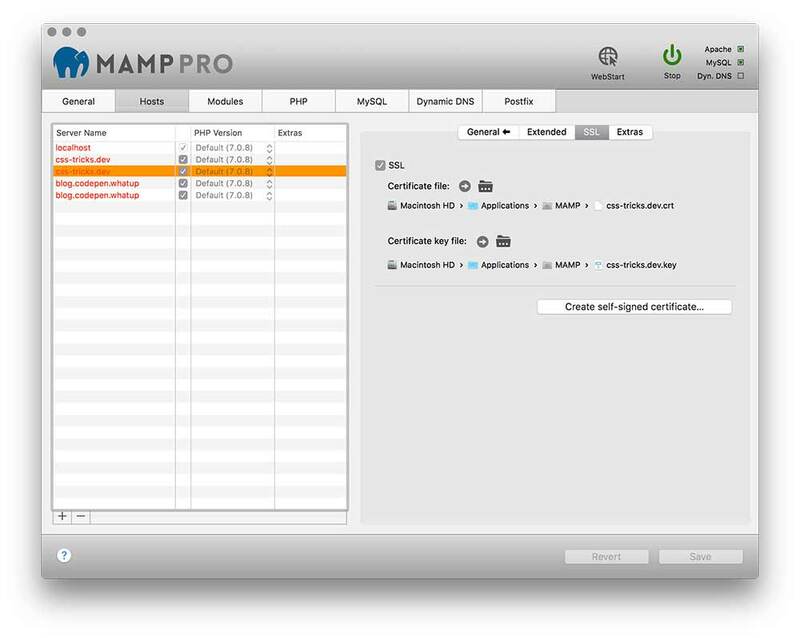 When you create the local certificate through MAMP, you were prompted to save it somewhere. Wherever you did that, find it, and drag the certificate into Keychain. If you can't remember where that certificate is because you created it like 100 years ago, you can get Chrome to give you a copy of it. From there, you can click-and-drag the certificate icon out to wherever you want a copy. Then drag it into Keychain Access. 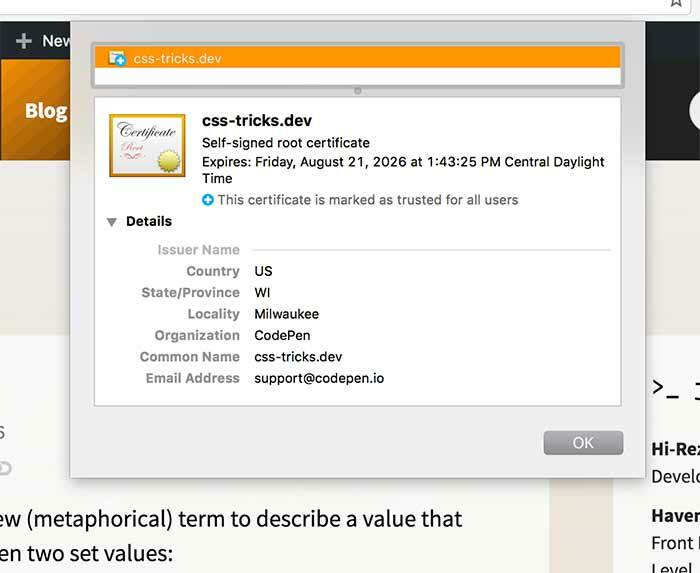 Then double-click the certificate in Keychain Access and expand the "Trust" area. 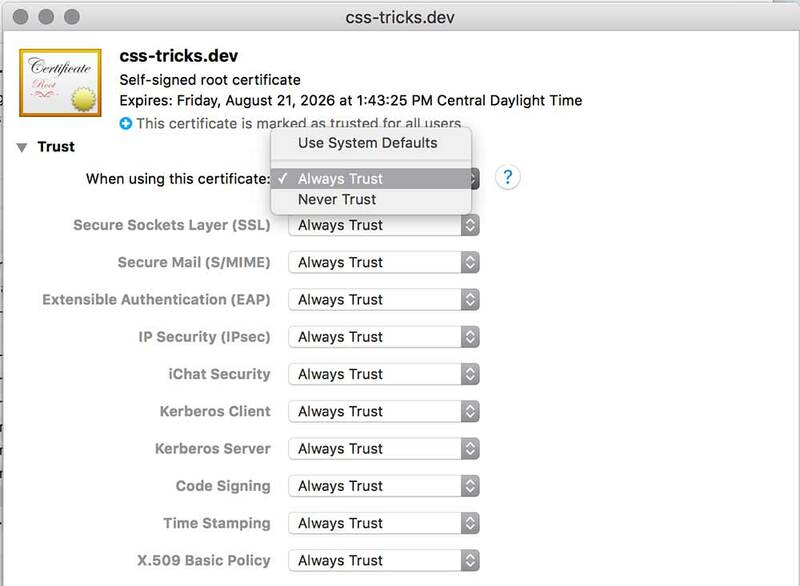 You can adjust the "When using this certificate" option to "Always Trust". Have you tried using Vagrant for your local web server? That way, you can get as close as possible to the production environment. It also allows you to create a different VM for each site so that you aren’t limited to just the configuration of your MAMP stack for all sites you develop. If you do a lot of WordPress development, Vagrant with VVV is really helpful. Bypass the fact it’s a mac, run it on a separate box (or VM) with rsync keeping the live SSL’s. For anyone using subdomain multisite – MAMP disables aliases when enabling SSL because you need separate certs for each subdomain. So you’ll need to stand each subdomain up as a separate host entry (including the subdomain). Nice little trick Chris and thanks for sharing. When copying/dragging the certificate from Chrome on a Mac and trusting it in Keychain you can delete the copied certificate file. So, when you drag the certificate out of Chrome you don’t need to place it in a long term storage location. Unless of course you really want to. 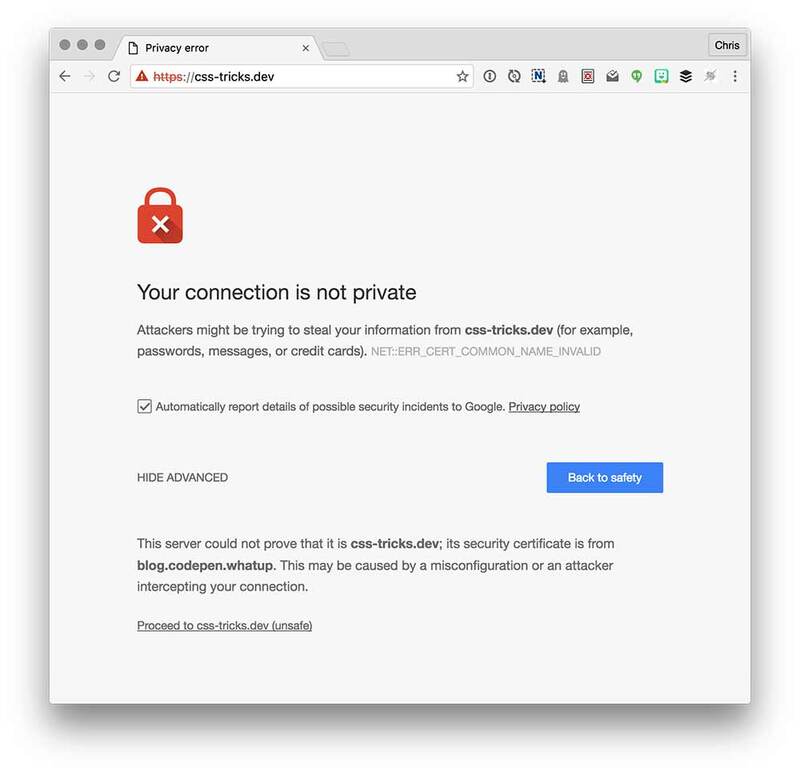 The Chrome copy trick also works great for virtual environments where the certificate is not accessible from the host computer. Works great for repetitive use. If you are running on a Mac you should check out Valet (https://laravel.com/docs/5.3/valet) from Laravel but it supports loads of different CMS’s/Frameworks and getting SSL working without any hassle is as simple as typing valet secure, I binned off MAMP as soon as it came out. …it would be really important to note that the certificate should be imported to the “System” Keychain. At least on my machine, it didn’t work first, since I was always importing it to my “Login” Keychain.